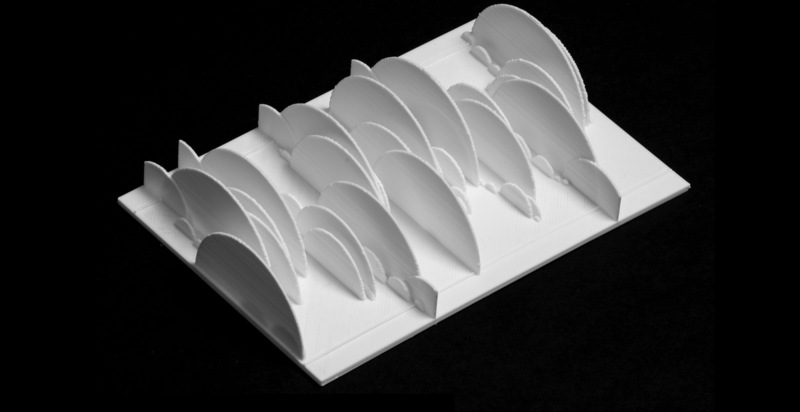 Versus 0.02 [gridiron] artistically interprets the game data of the 60 minute football game into 3D printed depictions that visually condense the game into a single frame. versus 0.02 [gridiron] is part of a larger body of works, versus, which explores the spectacle of sports through data interpretation via sonification or visualization. The versus 0.02 [gridiron] series currently has a total of 51 sculptures, each representing one of the 51 Professional Football Championship Games, also known as Superbowls, played in the years 1967 – 2017. The sculptures analyze the game play-by-play and visualize the distance the ball traveled regardless of type of play. We use data sets from publicly available sources and run it through a custom created parametric algorithm created in Rhino and Grasshopper. Our parametric algorithm then builds 3D arcs based on the distance the ball travels across a rectangular plane referencing the topographical landscape of the football field. We had to establish a few mapping rules to make the visualization identifiable. Penalties are factored into the beginning of the play. Touchbacks are registered 2 yards behind the goal line, Touchdowns 5 yards, extra points 20 yards, Field goals 15 yards and safeties are 9 yards. If a ball is brought out from the end zone, it registers at the 0 yard line of the respective team. In order to keep the flow of the game recognizable, the teams are assigned a side and remain on that side. The kickoff team can be identified by the kickoff arch. Plays are numerically advanced from the front to the back. The data of every drive is compiled in a .csv file and enumerates the motion of the ball reducing the game to a simple numeric dataset. In turn these numbers get fed into our parametric model and once the software interprets it, we bake the outcome as a 3D printable file (.stl). 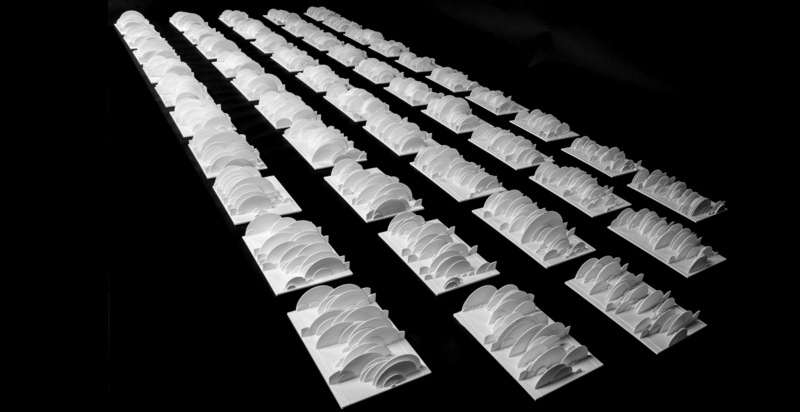 The print is based in scale on the size of an american football field (120 by 53.3 yards), but the width of the sculpture depends on the number of plays. The largest sculpture we printed is about 18” long 9” wide and 9” high and it took 5 days to print. We keep the colors of the work monochrome as to represent the game as one spectacle. We view the physical manifestation of the data as a stand alone sculpture, to be presented on a pedestal in a gallery environment. And although this abstraction is completely juxtapositioned to the physicality of the game, looking at the sculpture immediately reveals the dynamics of the game - showcasing the back and forth and the intensity of it or clearly demonstrating the overmatching of one of the opponents. In our experience once viewers realize the context of the work and recognize it as a game they have actually seen, they start to analyze play-by-play (studying the arcs) and recall their emotional involvement, forming a contextual narrative between the sports event and the artistic interpretation. //benitez_vogl is an artistic collaboration of Margarita Benitez, media artist and the Fashion Technologist and Associate Professor at The Fashion School at Kent State University and Markus Vogl, media artist and Associate Professor in Art at the Myers School of Art at The University of Akron. Associate Professor of Fashion Design – Fashion Technologist, The Fashion School – Kent State University. Associate Professor of Arts – Graphic Design and Interactive Media, Myers School of Art – The University of Akron. The project has received an “Honorable Mention” by CO.design’s Innovation by Design Award.